The digital economy has allowed increasing numbers of nonresidents to work remotely for California firms without becoming California residents, and even without paying California income taxes (see my article Nonresidents Working Remotely for California Businesses ). At the same time, more and more nonresidents find themselves being offered lucrative temporary employment in California. This is particularly true for software developers or other information technology and e-commerce specialists who are in high demand by California’s thriving internet firms to complete a particular project. But it’s also true for medical professionals, management strategists, actors, professional athletes, artists, corporate trainers, even part-time teachers in a specialty field. What all these professionals have in common is project work. The employment in California is temporary in that it involves completing a particular project or term of service. It isn’t permanent. It isn’t open-ended. Of course, temporary is a relative term. Some projects may only last a few months; others may require more than a year to complete. The issue confronting nonresidents working temporarily in California is whether they will be taxed only on their California-source income or become a resident in the eyes of California’s tax authority, the Franchise Tax Board. 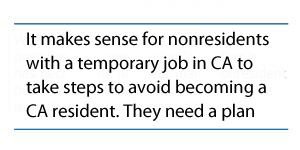 To control that, nonresidents working in California should have a plan. 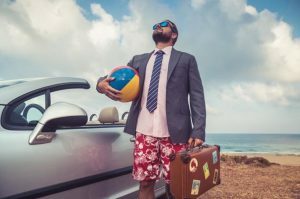 At first blush, it might not seem to matter whether a nonresident working on a temporary basis in California is deemed a resident or not. The wages or 1099 (independent contractor) income received while working in California is taxable by California regardless of residency status. That’s inescapable because the work is performed in California. If all the income the worker receives during that tax year comes from the project, it doesn’t make any difference what his residency status is. However, if the taxpayer has other sources of income, it makes a big difference. The FTB only taxes nonresidents on income sourced to California. But it taxes residents on all their income, from whatever source. And the top rate is 13.3% (in 2017). People who work in IT and e-commerce often work on various projects at the same time, or they have an ownership interest in separate businesses which can produce significant non-California income. Or they may simply have investments in their home state which generate dividends or other taxable distributions. If they are nonresidents working temporarily in California, the FTB cannot tax any portion of their income sourced to other states. But if they are residents, that income is subject to California taxes. Moreover, once a person is deemed a legal resident of California, it takes some doing to change residency to another state. It doesn’t automatically end when the employment in California does. For these reasons, it makes sense for nonresidents with a temporary job in California to take steps to avoid becoming a resident for tax purposes. They need a plan. On its face, the rule governing working in California is simple. If a nonresident moves to California for a temporary or transitory purpose, then he does not become a legal resident. Such a temporary purpose includes employment in California that is other than permanent or indefinite. But what constitutes temporary work in California? How long is it allowed to last? How is the temporary nature determined? The regulations and case law offer some guidelines in answering these questions, but the real answer is, it depends on all the facts and circumstances. California has few bright-line rules on residency status, and none of these applies to in-state temporary work. The FTB looks at all the contacts a taxpayer has with California and other states, including the job in California, to determine legal residency. That doesn’t mean nonresidents are left totally adrift. There are a number of basic considerations nonresidents working in California can plan for to control their residency status. Some are relatively easy to manage. Others take more planning and expense. Let me discuss two of the most important considerations: the employment contract and living accommodations. The nonresident should have a written employment contract with his California employer (sometimes the contract is for an independent contractor, but the principles are the same). If there is no written contract, the FTB will presume the employment is permanent or indefinite, and that can confer residency status. The burden will then be on the taxpayer to prove the job wasn’t intended to be permanent, which may be a difficult task a year or more after the employment ended when an audit might start. Accordingly, the contract itself should spell out the “term” of the employment – that is, when it will begin and end. That can be expressed in terms of a time period, or the accomplishment of a task, which is usually the case when the job involves an IT project. It shouldn’t have a renewal clause. The contract should also set forth the “duty days” required for the project (for a discussion of “duty days” see Nonresidents Working Remotely For California Businesses, mentioned above). Even if the contract is full-time and lasts the entire year, this can be important if, as is often the case, the project requires you to work both in and outside of California. The pay related to the work while in another state is not taxable by California, if you are a nonresident. If the contract involves high wages and includes sophisticated financial and intellectual property relationships, such as noncompete or nondisclosure clauses (as is often the case with IT contracts), then the payments should be allocated between wages and the other items, if possible. While the wages are completely taxable by California to the extent they are earned while working in state, the other items may not be. Noncompete agreements, for instance, involve a complex allocation of payments between California and other states if they reach outside of California. Generally, the employment agreement should be drafted to make clear you are a nonresident and you plan to return to your home state upon completion of the project or termination of the contract. If the purpose of the project is ultimately to develop and then move some division out of state (which is also often the case), that too should be set forth in the recitals. Even with a properly drafted employment contract, a nonresident can still find himself facing an FTB residency audit if his choice of living accommodations is not well thought-out. In a perfect world, the nonresident will not give up his residence in his home state. That may be easier said than done if the project is going to last more than a few months. And that’s especially true if the taxpayer only rents in his home state, which is common among younger employees. Maintaining two households may be financially prohibitive. But even if you have to give up your home-state residence, that doesn’t automatically make you a resident of California as long as it is clear your stay here is temporary. The way to signal that is to avoid a long-term lease for your California accommodations. In a perfect world, you should stay in a hotel, but again, that might not be practical if the contract last for a long period. In that case, a short-term or month-to-month rental should used. Some firms, especially in the IT industry, offer short-term living accommodations for temporary workers. If they do, take the offer. Along with the living accommodations comes a whole host of contacts you need to plan for: what vehicle to use, where to tell your employer to send your tax documents such as W-2s, where to store your furniture and furnishings if you give up your home residence, where to vote, what bank to use, how your social media reports your new job. These should be dealt with systematically and not left to chance. Remember, the FTB looks at all the facts and circumstances, all the contacts you have with California and other states to determine residency status. While working in California you will ordinarily be subject to the withholding and payroll taxes facing any resident employed in California. You’ll file a nonresident California tax return in April of the next year (a Form 540NR). If all goes well, the FTB will accept your nonresident status and you won’t hear from them again. If, however, they send you a notice asking for documents or information about your residency, at that point you should seek tax counsel. Manes Law is the premier law firm in California residency tax matters. We assist business people and retirees moving out-of-state, entrepreneurs engaged in e-commerce or working remotely from out of state, and professional athletes, actors and artists, avoid the many traps of California’s residency tax system. Learn more at our website: www.calresidencytaxattorney.com.